It was nice of you to come visit us. I really enjoyed the tapes when your grandfather was talking. It was nice of you to write a story about your grandfather. It was much nicer that you made a book about his brother Edward. I have enjoyed your first, I think I will enjoy your 2nd and 3rd book as well. Thank you for coming to our school. I really enjoyed the book 'Fly Little Bird, Fly!'. I learned alot about the orphan trains and I liked it. When I heard that you were coming to our school I was excited because I never saw an author before. I also really had fun listening to Oliver. Thank you so much for coming to talk to us about the great and exciting book that you wrote about your grandfather. I truely liked your book because it was exciting to read about someone's real true life history. I think you are a great writer and a great person to put someone's life story on paper. You know that you have, what I would call, a gift or a true talent for not only writing, but for listening to people when it comes to personal or historical events. My favorite part of 'Fly Little Bird, Fly!' was how Oliver looks out and takes care of his little brother Edward. Thank you for coming to our classroom. One new thing I learned was that Rev. Brace started the orphan train and Sr. Fitzgibbons started the mercy train. One thing I learned about a writer was that when they write books they have to fill in the blanks. We enjoyed the time you spent with us. Good luck on your next book! Thank you for coming in and teaching us more about Oliver Nordmark. I can't believe that at an old age Oliver was so active. It must have been hard to live in a house with mud flooring! Your presentations for Young Readers Day were AWESOME - you have inspired me to better teaching. You are GREAT at it. The kids LOVED you and the teachers thought you were fabulous. It was a great day! Thank you for taking the time to speak to my students. You were a big hit! At least half of the book buyers have already started to read the second book. Four brought in their copies to show me where they are in the book - that is how excited they are about your grandfather's story. Such an enthusiastic response is a credit to your writing and presentation! I am still hearing good things about your visit! Both the students and staff really enjoyed your presentation. In fact, I have two orders for two more sets of your books! Thank you for visiting us yesterday. You made quite an impression on many of my students. I made a CD of the pictures I took and will mail them to you. Happy Holidays and thanks again! We appreciate your visit to Hockessin Montessori and sharing both your grandfathers's story and your own journey in the writing of it. We will be watching for the next installment! 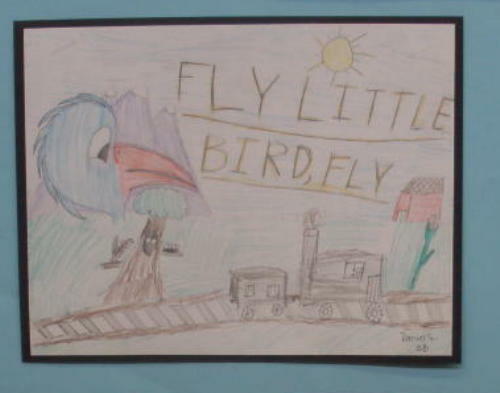 Student Artwork - ST. JOHN THE BELOVED SCHOOL "Building a Sod House"
Oliver's granddaughter, Donna Nordmark Aviles, has spun the story of Oliver's family into two finely-wrought children's books, 'Fly Little Bird, Fly!' and 'Beyond The Orphan Train'. Aviles' books contain the saga of a family torn apart, and the contrasting destinies of Oliver, who eventually fathered six children, and Edward, who ended up in prison for armed robbery. Now those volumes may be spinning themselves into cinematic gold. They've recently been optioned by Hollywood screenwriter William Rotko who co-wrote the 2007 film 'Breach', about CIA turncoat spy Robert Hanssen. "It's a family story," Rotko said. "This is uncovered territory in film, the idea of the orphan trains. Shipping kids out west to find themselves can be both literate and cinematic. It's great fodder for the movies because of the dramatic possibilities of the brothers' contrasting fates. They're forced to separate. We see the darker side of overpopulation, and these organizations. Kids shouldn't be separated." It was Aviles' writing that appealed to Rotko. "She's able to write the story in these books wonderfully," he said. "She's a young writer, new to the craft, and she's able to accomplish that. It's very difficult." Aviles said selling the rights to the story to Rotko isn't about the money. "It's about the thousands of children who never talked about what they went through, and who lost their place in history." 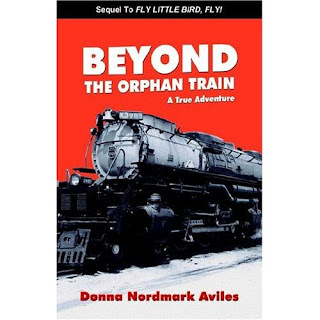 Donna Nordmark Aviles has written a compelling story about two boys, ages 5 and 7, who find themselves in an orphanage, then are put on a train and sent west to work as farmhands and have to learn life's lessons the hard way, on their own. In two books for children, the local author writes of the extraordinary true-life adventures of her grandfather and his brother after they were loaded onto the infamous orphan train. Student Artwork - ST. JOHN THE BELOVED SCHOOL "Shooting Crows"
Rotko's father is always on the lookout for good, cinematic true stories for his son to turn into movies. He said he has made plenty of suggestions in the past which his son ignored but were later made into movies by others. But this story was too good for Bill Rotko to ignore. In fact, it was so good he had to call Aviles to make sure it really was true. Aviles cared most about doing her grandfather's stories justice. Oliver Nordmark loved telling the story of his fascinating life to anyone who would listen. It was a tale worth telling of hard work, thrilling adventures, various careers and a decidedly positive attitude. Conversely, his brother came out of his early hardships a criminal, angry at the world. Their relationship is part of what makes their stories so compelling to Bill Rotko." The books are based on Oliver's recordings, and the stories that he told to his youngest son, Benjamin (the author's father). The stories tell of the hardships of being a young laborer living with and working for strangers, but they also tell of the rewards of being recognized as such, as Oliver was. Both books are written for the young reader, ages 8+ but they also provide an easy, interesting read for adults, especially those interested in this unique piece of American history." The book, 'Fly Little Bird, Fly!' is a true story by Donna Nordmark Aviles that follows the adventures of Oliver and Edward in a journey-like, adolescent-geared adventure. The audience is younger so the book is set up as a story that keeps the reader asking questions like - What happens to Oliver? Will the brothers find a family to love? Upon their separation at the age of 9, will Oliver be able to keep his promise to find his brother?" In search of a place to belong, some will travel thousands of miles. "Fly Little Bird, Fly!" tells the story of Oliver and Edward, two orphans with no place to go. Riding a train from New York City to the Midwest, the two embark on an adventure in search of a family to love and to love them. A moving story of the determination of children, "Fly Little Bird, Fly!" is a fine novel for young readers, sure to please. Also recommended is the book's sequel, "Beyond the Orphan Train", continuing the story of Oliver and Edward. Growing up as a kid, I was always interested in history. So much so that I ended up getting an advanced degree in a related field and much of my time is spent researching and writing about prehistoric North America and United States history. However, I was always interested as a kid in the more "exotic" forms of history - Native Americans, ancient archaeological sites, the land before "discovery" and so on. I didn't pay a whole lot of attention to European or United States history in terms of what is often called "White Mans" history. One of the reasons was simply that it was often taught in a very boring manner - especially for a rambunctious kid in elementary school. I never thought this was a problem until recently. As my wife and I begin to think about our own kids and how they are being educated, I've realized the importance of making sure they know US history, and have decided to hunt down and find books that DO teach US history - but in an exciting, adventurous way. Well, I'm pleased to say that I've encountered two books that not only teach important parts of American history - and parts that I didn't even know took place - but that also are written in an engaging and readable style for my kids. 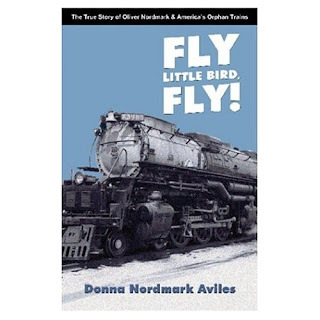 The series by Donna Nordmark Aviles - Fly Little Bird, Fly! and Beyond The Orphan Train - are two books that cover an important but little known part of US history. Not only that, but these two books are based on real stories and real events and are written in a style that my kids could approach. Telling the true life story of Oliver Nordmark, these two books take the reader on an adventure beginning in New York City but that soon moves to the Great Plains at the beginning of the 20th century. Shipped out on what was called the "Orphan Train" by the Children's Aid Society, Oliver and his brother Edward soon find themselves in the Great Plains working as farm hands. Engagingly written, these two books give a first-hand account of what it was like to be young orphans at a time when America was booming and the Great Plains were still a vast grassland with small farms, local communities, and independent folks. Reading these two books to my kids was a great pleasure. Not only did they learn about life on the Great Plains when farming was a major occupation, but they learned about the amazing life of Oliver Nordmark. History always sticks in the mind when you are able to empathize with the story, and in these two books that was no exception. Declared an orphan at the young age of eight, Oliver (and his younger brother Edward) rode the Orphan Train to Kansas where they were placed with a harsh, unforgiving farm family. Escaping after several hard years, they are split up as they jump trains and travel further west, learning the ropes of jumping trains, living with hobos, working on farms, and avoiding the authorities. Like I said at the beginning, these stories chronicle a time in American history that many people are unfamiliar with. I'm glad that I encountered these two books - and that Donna Nordmark Aviles decided to share the story of her grandfather. Not only did I learn something from reading these stories with my kids, but I think they did too. I know this because recently they have been asking me all sorts of questions about what life was like on the Great Plains at the beginning of the 20th century: How did people survive? Did people really live in sod houses? Were orphans really given to farming families to help with the labor? Fly Little Bird, Fly! 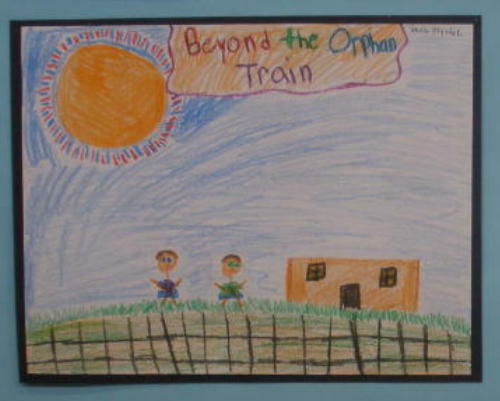 and Beyond The Orphan Train are two excellent books that every kid growing up in the US should read. Understanding the settlement of the Plains from a personal perspective is a powerful method for teaching history. I'm glad I found them and read them to my kids. Hopefully other families will do the same - these are important stories that chronicle an important time in our collective history. Oliver Nordmark is fifteen years old when he decides to jump on a moving train and "ride the rails" through Kansas, looking for work and a better life. 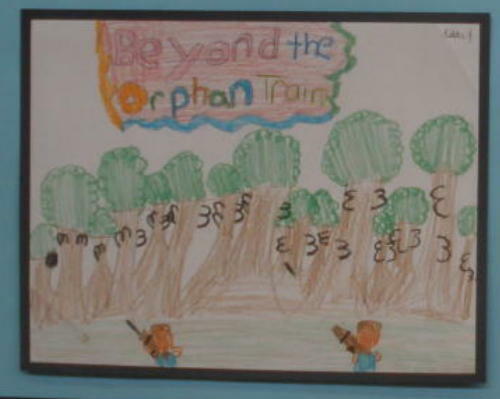 Beyond the Orphan Train picks up the story of Oliver's life where Fly Little Bird, Fly leaves off. Oliver is an orphan, a former rider of the "orphan trains" which transported children from overcrowded orphanages in the east to Midwestern towns where they were generally taken on as farm laborers. Yes, small children - used for labor. At fifteen, Oliver realizes that after seven years of free labor for Farmer McCammon, he has nothing he can call his own. He makes a snap decision to strike out on his own, hoping to earn money which he plans to use to locate his younger brother Edward, whom he hasn't seen in half a dozen years. Oliver is haunted by a promise he made to Edward when they were children together on the orphan train -- that he would not allow them to be separated - a promise that he had been unable to keep. Beyond the Orphan Train is the true story of the author's grandfather's life, and it was a sad and difficult life for certain. Sometimes it seems as if Oliver and his brother must have been terribly unlucky to have so much unwarranted misfortune in their lives. And yet, through it all, Oliver maintains his dignity, his determination, and his sense of humor. "Nothing ventured, nothing gained" is his philosophy. Sadly, Edward does not develop the same positive moral character as his brother, which the reader will come to find out before the end of the book. A wonderful depiction of American life in the early days of the twentieth century, Beyond the Orphan Train will be sure to educate and entertain readers of all ages. Oliver Nordmark represents the all-around American youth - optimistic, keen to learn, and willing to make his way in the world through hard work and resourcefulness.